FCPX Effects Developer, Pixel Film Studios, Releases ProDrop Particles. Pixel Film Studios announced the release of ProDrop Particles a new FCPX Plugin for Final Cut Pro X. This FCPX Plugin was designed to be easy to use, as simple as drag and drop. 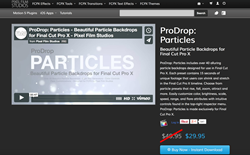 ProDrop Particles includes over 40 particle backdrops designed for use in Final Cut Pro X. Each preset contains 15 seconds of unique footage that users can shrink and stretch in the Final Cut Pro X timeline. Choose from particle presets that rise, fall, zoom, attract and more. Users can customize color, brightness, scale, speed, range, and flare attributes with intuitive controls found in the top-right inspector menu. ProDrop Particles is made exclusively for Final Cut Pro X.
ProDrop Particles comes packed with content. In this package users will receive particle emitting presets in a variety of animation styles. Users can choose between presets with small, or large circle particles or opt to use hexagonal particles instead. Each preset has a unique style and is fully customizable so that users can achieve any look using ProDrop Particles. All particle presets in ProDrop Particles include a completely customizable flare source. Users can change the size and color of the source as well as the brightness and the offset of streaks. Streaks can individually be adjusted using 4 intuitive sliders so that users have full control over the flares. ProDrop Particles also includes unique light ray backdrops sans particles. ProDrop Particles comes with two types of orientation controls. The majority of presets in this package include a drop-down menu with a list of sides, or angles particles can emit from. Moreover, presets with centered particles include on-screen controls so that users may place them anywhere throughout the scene. Using ProDrop Particles is as simple as dragging and dropping generators into the FCPX timeline. Users can resize and adjust parameters in the Inspector window using intuitive sliders, drop-down menus and dials. Freely shrink and stretch generators to the desired length and then adjust the speed attribute to account for new timing. Pixel Film Studios makes editing easy using ProDrop Particles.